The following information was obtained from the Vintage Airstream news group. This is the procedure I used for polishing my trailer. However I started with an aluminum acid wash to clean off the 50+ years of sap and grime. I will be shortly posting photos of this polishing process. 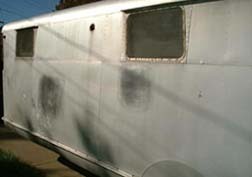 The trailer after acid bath with test spots showing the effectiveness of the polish. A good wax is recommended after the polishing to preserve the finish. Since this was written better polishing methods have been found. There are many acceptable methods for polishing , however the following procedure has worked very well for us. Some experimentation is advised to see what works best for you! Polishing Tips There are 3 basic Rolite polish products that when used properly will produce a beautiful brilliant shine to aluminum, stainless steel, chrome and painted surfaces. The first product is Rolite pre polish. This is a slightly more course polish and is used to "break down" never before polished aircraft or highly oxidized or slightly corroded skin. The second is Rolite metal polish & fiberglass cleaner. This is an extremely effective polish and will produce a very nice shine on most all metals. It is wonderful around the house for Brass pots, planters and especially for the automobile. The Third is Rolite AP300. This is by far the best product I have ever used. It is used on aluminum and is effortless in comparison to using other polishes. Please note, when using AP300, be sure to use about half of what you would normally use when polishing a little goes along way. When you use to much you will load up the buffer pads. Experiment with it and you will figure out how much to use. Step 1 - For Aircraft that have never been polished or have not been polished in many years and show heavy oxidation Clean surface of excess dirt, sand and oil residue with soap & water or solvent. Use Rolite pre polish and pad # 575. Apply polish by hand in a small 12" x 12" area. Buff on lowest speed setting until polish is gone. Repeat until you get a nice bright shine. NOTE - Between applications wipe off black residue with cleaning solvent. Do not let black residue remain in cracks and around rivet heads for more than 5-6 hours or it will be very difficult to remove as it dries very hard. When using a buffer be very careful and anticipate the direction of pad rotation so you do not hurt the aircraft or yourself. Also very important keep the pad moving so you do not burn the metal. A burn mark is a deep bluish brown colored haze deep in the metal. The best thing you can do is leave the affected area alone and let it cool and return later to try to buff out the mark. Sometimes you can not remove them. After pre polishing you will have a deep shine with very noticeable swirl or pad marks which will be removed in the next steps. Pre polishing is sometimes the most difficult step and may take several applications to get the desired results. Remember to experiment. Step 2 Repeat the procedures in step 1 using Rolite metal polish & fiberglass cleaner or Rolite AP300. Sometimes the step after the pre polish will need the metal polish then AP300. That is dependent upon the quality of the metal and the desired results. However, I do recommend AP300 as the final polish as it is the best we have found. After polishing, use solvent to remove the black residue and remove as much black residue as possible. The solvent will leave a hazy film on the metal. At this point it is time to final clean to a brilliant shine. Step 3 Use a clean soft towel and vinegar base glass cleaner ( usually green colored). Hand rub the haze away leaving the shine. This step must sometimes be performed just to check the quality of the shine and depending on your desire results you may have to polish the area again. Step 4 Rolite makes a polish & sealant that helps protect the finish and "seals" the shine. It does slightly decrease the shine but it certainly helps in maintaining the shine. Maintenance To maintain, simply use a clean soft towel and the vinegar based glass cleaner. In oily areas you will want to use a different towel and a little solvent. Then follow up as usual with the glass cleaner. This polish and basic procedure has helped us achieve champion quality aircraft. There are many variables involved in the polish process and that is why we recommend experimentation. I hope these basic procedures will help you achieve the results you desire on your polished aircraft. If you have any problems or question please feel free to call us. Other quantities available upon special order. Prices do not include shipping. Illinois residents subject to sales tax. Thank you and good luck! contact: Mike VadeBonCoeur Midwest Aero Restorations Ltd.
Vermilion Co. Airport 22563 N. Bowman Ave.